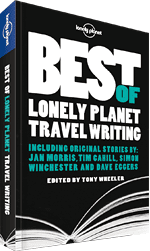 So in pursuit of new travel writing muses, I tucked into a compilation of short stories from the folks at Lonely Planet. (Yes they make money in so many ways it makes me want to cry.) And it was about what I expected. A lot of different styles, some fantastic tucked between a whole lot more of boring. What I realized with travel writing is this: You have to have a really great experience to write a really great story. And so despite all the writing styles, it seems Rule #1 is to go someplace different. Do something different. And I wonder, am I doing that? Not really, I suppose. Maybe I need to be a little crazier. At any rate, yes, there are big differences in writing styles. One painful story was of a girl spending a summer in Prague and going on and on in stream-of-consciousness style about finding a boyfriend. Bleeggggh. I wanted to poke my eyes out halfway through. But some stories were so brilliant and so well written that I was sad they were so short. Tony Wheeler, the editor of the series, has a technique that I have tried to adopt a bit in this blog. He always starts with the climax of the story, and right before the resolution he stops. And then goes into the introduction and background that got him into that particular situation. I knew what he was doing, he was creating a "hook." Once he hooks you, hopefully you stick around long enough to read all the background info. Then he tells how he got out of the situation and usually tries to have some sort of twist. For instance, one story called "The Yogurt Riders" has him being chased on horseback in Mongolia by people holding shiny metal. In the end he reveals that they are selling yogurt in buckets, and his group is just sick and tired of yogurt and was trying to get away. In between he has a lot of interesting stuff on Mongolia. Funny and good. In another of his stories, it opens with a man cracking his head open on Tony's car windshield. It turns out to be a nice story about circling sacred Mt Kailash in remote western Tibet, but as they were leaving a drunk crazy man toting a gun decided to go berserk on them. The cops shot him in the leg and that was that. Of all the stories in the book, the funniest is by Stanley Stewart going "upriver" to some long-houses in Borneo. At one point, drunk, he is asked to dance immediately after watching some great dancing by the locals. He ends up pulling out all the ridiculous moves white people learned in the 80's, funky chicken, running man, and poor attempts at break-dancing. The crowd goes wild and they are in tears laughing. He ends the trip at the end of the river, a remote spot that the boats can't go past. It was a beautiful bit of pristine forest, a touch of Eden. His combination of witty observations mixed with poetic descriptions make him a great writer. But most of all, he had a unique experience from which to make a compelling story. Finally, the most beautiful story comes from Simon Winchester, "Ascension in the Moonlight." By coincidence he finds himself on a steamer near the remote outpost known as Ascension Island, in the middle of the Atlantic. He takes a dodgy boat and jumps up on the cliffs, hoping he can catch a flight back to England and save himself a couple weeks. A local priest, unlucky to have been sent to this desolate rock in the ocean, nevertheless kindly shows him around. On his last night, the priest and his wife (Anglicans) take him a picnic basket and tell him to jump in their car at sunset. Night falls, and suddenly a dark shape waddles up the beach. It is a giant sea turtle laying its eggs. A bit later, incredibly, a full lunar eclipse occurs and the stars became tremendously bright. And on the horizon, to his disbelief, a comet! He finds himself in a state of pure bliss: surrounded by the friendship of a strange couple, the turtles who had swam from Brazil, and the spectacle in the heavens. It was written so beautifully I almost wanted to cry. When he returns to England he enters a tailor shop, and when he takes off his jacket pure white sand falls onto the shop floor. He tells the tailor his story, and the tailor thinks for a moment before replying. "You know, you are a very very lucky man indeed. Lucky to be in such a place. Lucky to see such things. And luckiest of all to meet such very kind people. I envy you. Everyone must envy you. Wherever would you be -- have you ever wondered -- without all their kindness, and without all this luck?" When you travel sometimes, especially budget travel, you experience truly beautiful things, tremendously sad things, get robbed one day and are amazed at the genuine kindness of strangers the next. You are taken out of your comfort zone and are forced to see life as it truly is. Its something special that doesn't happen in everyday life back home. When I meet fellow travelers, their eyes light up as they explain what they saw and felt on their journey. We all want to share these feeling with our friends and family, but few are capable of transporting people into that experience. One day I hope I can do it, to be a writer. But either way, I do indeed feel very very lucky to be here.